JVC launches upscaling 4K projectors with new e-shift2 technology | What Hi-Fi? JVC has launched four new 3D projectors, with the top three in the range all capable of upconverting and upscaling 2D content to 4K resolution pictures. JVC has upgraded the e-shift technology introduced on last year's models, now called e-shift2, allowing the flagship DLA-X95R, the DLA-X75R and the DLA-X55R models to upscale standard video content to 3840 x 2160, 4K images. 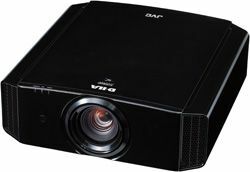 The entry-level model in JVC's 2012 range is the DLA-X35, which is a standard 3D projector without the 4K upscaling option. All four projectors offer improved 3D performance, with new circuitry and a new optical engine claiming to reduce crosstalk. There are new active shutter 3D glasses, too, using RF rather than IR technology, aiming to provide more stable synchronization and extended range. A new lamp and power supply claims to boost the level of brightness, while the native contrast ratio has been improved too through the use of a new polarizing grid. The flagship DLA-X95R now claims a native contrast of 130,000:1, the X75R claims 90,000:1, while the X55R and X35 claim a contrast ratio of 50,000:1. There's also a new app for smartphones and tablets offering remote control of the projectors. The DLA‐X95R and DLA‐X75R feature full color management, ISF certification and advanced calibration functionality. In addition, JVC says they are designed to achieve THX 3D Certification and are scheduled for THX testing. The new JVC D-ILA home cinema projectors will be available from November 2012.